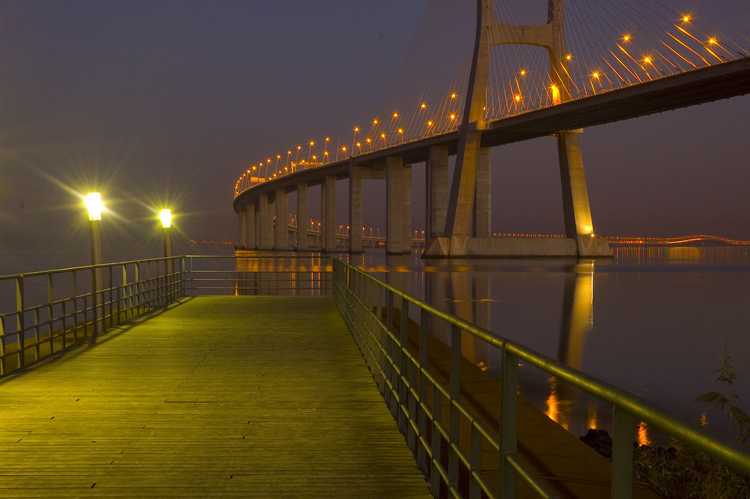 Photo "Vasco da Gama Bridge"
River Tagus Estuary, Portugal, EU. Excellent image you captured! Beautiful light and tones! It was cold, my feet wet by the wet grass, but I had to make a group of pics of the bridge site by night! No light abailable to fix the camera and the tripod ... but it was worth all the troubles! Very kind of you! Keep in touch! In Lisbon we have mild weather with some rain! Yesterday was sunny and beautiful! Thanks and Happy 2008, my friend! I enjoyed taking it and I am pleased that people like it! Отличная перспектива...этот прекрасный мост!!! Очень хорошее сочетание цветов и оттенков! Thanks to RAW file, PhotoShop and Nikon D70 ... and a choice of the right moment! Many thanks, dear Nina, have a Happy 2008!